Toads are slow-moving little critters, making them a perfect target for many predators—predators including even the smallest of pups. To make up for their slow escape, many toads are toxic. That means that if your pup eats, licks, or chews on a toad, she’s potentially at risk for toad poisoning. While some toads simply taste bad, other toads are potentially lethal to your pup. Puppies and dogs that live outdoors are most at risk for toad poisoning, especially around dawn or dusk in the warmer months when these amphibians are most active. Symptoms of toad poisoning generally show up quite quickly after exposure. Depending on what species of toad your dog was messing with, symptoms may vary. Smaller dogs are also likely to be more affected than large dogs, and whether or not your dog actually ate the toad will influence the effects. Unfortunately, many of these symptoms are very similar to symptoms of most other poisonings. On paper, toad poisoning can look quite similar to antifreeze poisoning or chocolate poisoning. Unless you saw the toad (or whatever else made your dog sick), you and your vet will have to work together to diagnose this problem based on symptoms and context clues. 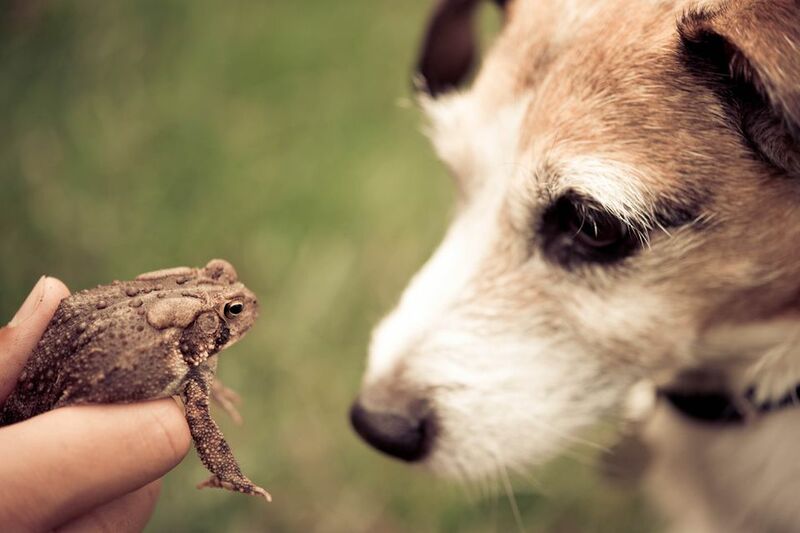 Not surprisingly, toad poisoning is caused by your dog coming in close contact with a toad. This generally means your dog put the toad in her mouth to play with it or try to eat it. In the United States, there are two main species of toads to worry about. These are the Colorado River Toad and the Cane Toad. The Colorado River Toad is also known as the Sonoran Desert Toad and is found in northern Mexico and southwestern United States. This toad is considered endangered in California. The Cane Toad is also known as the Marine Toad or Giant Neotropical Toad. These toads are quite large—up to 24 centimeters in length—and common across Texas, Florida, and Oahu. The Cane Toad is also common as an introduced species across much of the neotropics, from Fiji to Cuba. If you live in the northern United States, your dog is unlikely to come in contact with a lethal species of toad. That said, almost all species of toads taste terrible! If you’re outside of the United States, there are likely other species to watch out for. As with most cases of poisoning, this is a true emergency. Both of the toad species listed above can be lethal very quickly, even to a large dog. Because small amounts of venom are usually absorbed through mucous membranes, you cannot treat toad poisoning by inducing vomiting. There’s nothing in your dog’s stomach to expel, unlike in the case of chocolate poisoning. On your way to the hospital, if possible, flush your dog’s mouth and mucous membranes with large amounts of water. Time is of the essence in this case. Once you’re at the vet’s, your veterinarian may conduct a urinalysis (which may show high levels of potassium), give your dog a basic physical, and look at an electrocardiogram (ECG). Most of the rest of the treatment for toad poisoning in dogs is based on keeping the dog comfortable and safe. Your dog will be monitored closely and may be given drugs for pain, put in a cool bath, and/or given drugs to help stabilize vital signs. It cannot be overstated how important it is to get your dog to the vet right away if you suspect toad poisoning. Dogs who are brought to the vet’s within about 30 minutes of exposure to toad poison generally have a good prognosis. Otherwise, dogs don't have a high chance of survival with toad poisoning if you wait too long. Dogs are at most risk for toad poisoning if they spend a lot of time outdoors unsupervised. They are most likely to come in contact with toads during the warmer, wetter months, especially around dawn or dusk. You can keep your dog safe from toad poisoning by supervising your dog when she’s outdoors. Teach her a solid “leave it” cue and be extra-careful with puppies or dogs with high prey drive. If you know that your dog is likely to ignore your leave it cue and attempt to chase or eat something, then your dog should not be allowed to roam freely outdoors. You can also reduce the likelihood of toads coming towards your house by keeping your grass short and keeping water sources away from your dog’s favorite corner of the yard.